Info on bead show, motorcycle auction, a new rock 'n' roll party, "Marilyn" at Paris Las Vegas, pool parties, movie in the park and more. 1. All the beads you could ever dream of will be offered at the Las Vegas Renaissance Bead Show this weekend at Palace Station. There will be antique beads, homemade beads, seed beads and more. 2. The Mecum Motorcycle Auction is back at South Point on June 1 and 2. Check out and bid on hundreds of antique, vintage and collectible bikes. 3. The Monument Exhibition at Sahara West Library features works of art inspired buy Gold Butte National Monument with additional pieces highlighting TUle Springs Fossil Beds Monument and the Basin and Range National Monument. 4. The legendary band Journey will be in Las Vegas in September but you can catch a great tribue show much sooner. Lights is performing June 1 at Green Valley Ranch. 5. A new rock 'n' roll party -- Crash the Boulevard -- at Brooklyn Bowl will feature 3 of the hottest breakout artists to hit the Vegas rock scene on June 1. Celebrity Cars will be there with awesome cars and there will be an after party at The Roxy Room. 6. Rapper, songwriter and producer Logic returns to Drai's LIVE stage at Drai's Nightclub at The Cromwell on June 1. Hit tracks include "1-800-273-8255" and "Everyday." 7. After changing their name from the Pulsations to The Buckinghams to reflect the British Invasion craze, this American Sunshine pop group became an overnight sensation. They perform June 1 at Golden Nugget. 8. "Marilyn: The New Musical" starring Ruby Lewis is based on the life of Marilyn Monroe. The new show can be seen at Paris Las Vegas. June 1 would have been Marilyn's birthday. 9. Cool off in the pool at the Durango Hills YMCA on June 2 between noon and 2 p.m. for FREE! Live DJ, games, prizes, refreshments and more. 10. If you would rather attend a pool party that is strictly for adults, DJ Calvin Harris will keep the party going June 2 at the Wet Republic Ultra Pool at MGM Grand. 11. Enjoy a movie in the park with the family on June 2 at Bruce Trent Park. The featured movie will be "Wonder." Free popcorn and water while supplies last. 12. Join the folks at 7th & Carson restaurant for an afternoon of good food, custom cocktails and live music by jazz vixen Dame Madelyn on June 3. 13. The Nerd will transform itself into The Official Nerd Arena on June 3. All Pokemon Go trainers and collectors invited. Cosplay encouraged. TCG stations will be available. 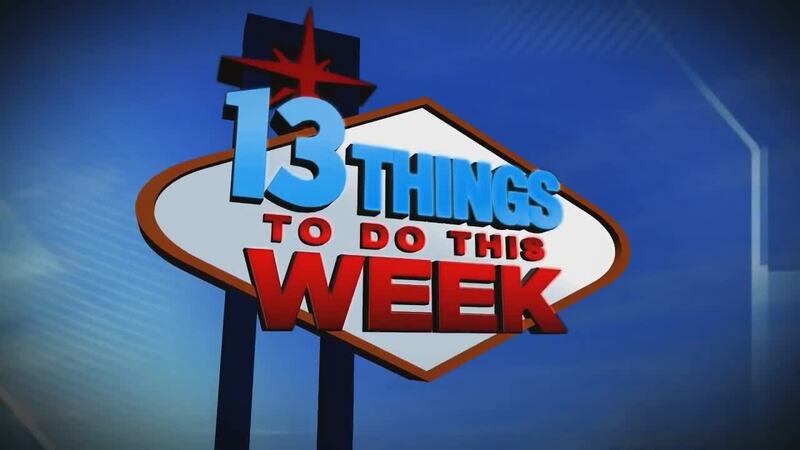 If you would like to submit an item for a future 13 Things list, please send an email with details to joyce.lupiani@ktnv.com.